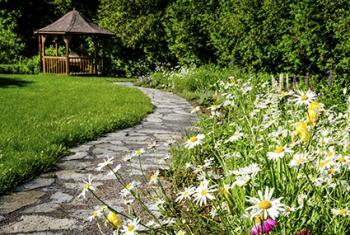 Flower bed edging lends character, texture, and definition to your landscape. Depending on the type of edging material used, you can achieve a number of attractive looks ranging from highly formal to rustic. Edging your flower bed often makes bed maintenance easier and helps keep plants and lawn or other landscape elements separate. 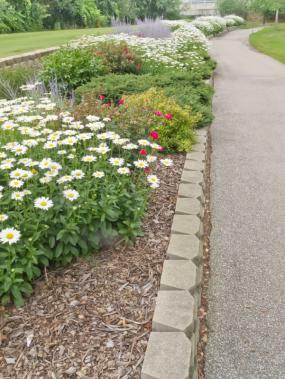 Although some edging material is more expensive than others, you can easily edge a flower bed with simple and cost-effective materials. Common edging materials are widely available at most home and garden centers and range in price from very inexpensive to fairly pricey. Keep in mind the size of area you need to edge and the overall theme and feel of your landscape before deciding on an edge type. This no-cost solution involves digging a ditch around a flower bed so that the lawn grass does not have any incentive to grow sideways into it. You can either leave it empty, or fill it up with a thick layer of mulch or decorative gravel. Make the ditch at least five inches deep and two inches wide for best results. Thin strips of metal are available in different colors and rolls of different lengths. Inserted vertically into the edge of the lawn at level with its surface, they form an impenetrable barrier to grass roots. Steel strips may rust after sometime, but aluminum ones are rust-free. Because metal does not bend well, use this type of edge for straight edge gardens. Decorative plastic edging is available in different colors, widths and designs. While this cost effective option may not be very elegant, it's super easy to handle and lay, and practically maintenance-free. It is also kind to lawnmower blades. 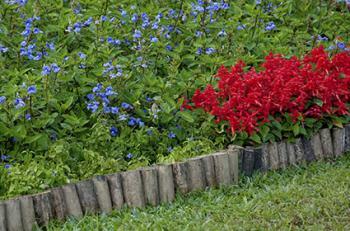 Plastic edging strips should be used for non-focal gardens. Long pieces of timber can be used for edging geometrical lawns and flower beds, while short bits can take curvy outlines. Strips can be as simple as a piece of two-by-four inch wood placed sideways in a pre-dug trench or larger pieces of wood for a more permanent appearance. Edging a natural garden with low-growing plants, such as small ornamental grasses including liriope or plants such as hostas, is a great way to create a natural and attractive barrier that sets off your garden from other areas in the landscape. Keep your border neat looking by trimming as needed. Time-tested and reliable, brick edging can complement traditional or formal gardening styles. Bricks can be laid vertically or horizontally. 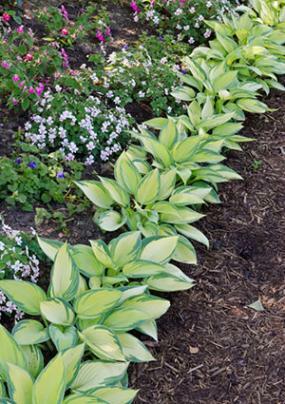 Laying them on a slant will create a zigzag border that will complete the look of a retro garden. Bricks can be used in both straight line gardens as well as curved gardens. 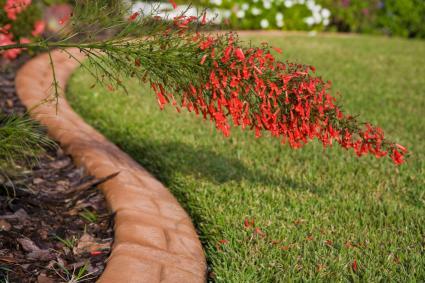 Terracotta, vinyl, or concrete tiles can make thin borders that rise above the level of lawn. Some have scalloped, or picket fence-like tops, for an added decorative touch. They can be somewhat costly, so tiles are best for smaller garden areas. Set six inches to one foot high, bamboo edging can lend a tropical look to the garden. You can buy it in rolls of closely-set bamboo sections. A variation on the bamboo edging is to use a timber log roll that goes well with a woodland setting. 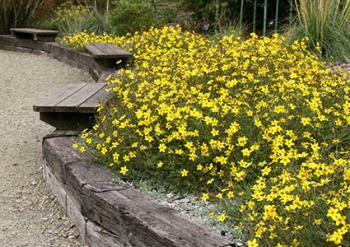 If you are a recycling enthusiast, there are many ways repurpose discarded materials as flower bed edging. Colored glass bottles - Choose from green, blue, and amber bottles, go for a monochrome arrangement, or have a mosaic of all the different colors you get. A single row of bottles embedded upside down with two to six inches of their bottom sticking out is striking but two to three tight rows would do a better job of keeping the weeds out. This type of edge is perfect for a small butterfly garden, herb garden, or any other high impact garden area you wish to feature. Beer cans - Remove the labels, fill the bottles with sand, and embed them upside down in a ditch filled with sand in such a way that only the top two to three inches are visible. Since this edging is not meant to be attractive, use it where you need an edge with no appeal. Sections of rubber tires - Embed the sections vertically with the longer edge facing the lawn. Fill with sand or gravel. Although practical, this garden edge is not overly attractive and is best kept to the back of your home. Sections of PVC pipes - Bury the sections into the soil close together and fill with sand. This edge is perfect when used in combination with a live edging such as a hosta edging. 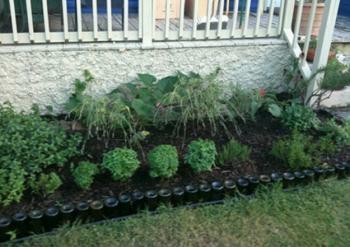 Between the plants and the pipes it is easy to keep weeds and other materials out of your bed. Try it when edging your vegetable garden. Logs - You can find logs of similar width and height at lumberyards or use logs that you may have in your landscape. Logs can be placed vertically or horizontally as an edge and are perfect for a rustic feel. If you use logs as an edge against a lawn, you may have a problem with grass growing between the logs. 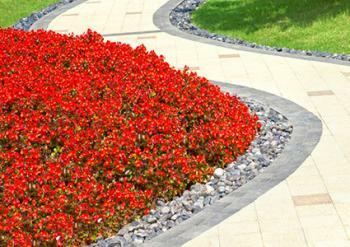 Therefore, they are best used to edge a non-vegetative surface such as a driveway or walkway. If you want the flower beds to stand out and be a focal point in your garden, choose a striking edging. Boulders - In an informal garden, a border of granite boulders of different sizes and shapes gathered from your own property will look great. For a more refined look, you can go for large river boulders. Boulders are a great option if you have naturally occurring rocks on your property, otherwise they may be hard or expensive to find. Concrete blocks - The hard but neat look of concrete is suited for a formal garden. Concrete blocks are no longer boring, as they come in all sorts of colors, textures, and designs. Concrete blocks are excellent if you have a straight edge to line; they can be a little tricky if you have a curved shape to follow. Stone blocks - If you like neat looks but abhor man-made materials, cut and shaped granite stones may be the option for you. These blocks are heavy and are best if you plant to leave them in place for a while. They also look good when used for a larger garden area with fairly big landscape plants or trees. If you like tending your flowers regularly, a wider, hard wearing edge makes sense. It will not only keep the lawn grass at a safe distance from the bed, but will keep you from stamping the grass all around too. Tiles come in different widths and lengths. They can be custom made too. Even though concrete is tough, durable, and cheap, its typical hard look may not go well with many gardening styles. Try softening the edge with a row of bricks. A path of irregular flagstones surrounding a flower bed right in the middle of the lawn can highlight a naturalistic planting. The spaces between the stones can be cemented or filled with pebbles. If square or rectangular flagstones are used for the path, edging them with a row of bricks will soften the lines. Paving instantly adds formality and definition to a garden. Bricks can be laid linearly or in different patterns like herringbone or basket weave. 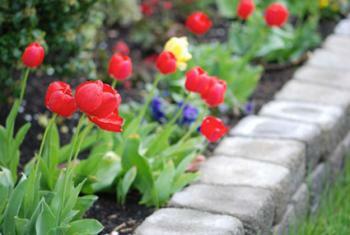 The earthy color of the brick blends well with most ground covers used in the flower beds. A moat filled with pebbles gives a Japanese garden-like look. If you have an undulating edge, the moat of pebbles can even create the impression of flowing water. However wide the moat of pebbles may be, it will not keep the lawn grass away, though. You need an impermeable barrier for that. The easiest solution is to line the moat with pond liner. The edges of the liner should be folded in and out of sight. Mix gravel into wet concrete and dump the mixture into wide ditch dug around the flower bed. When it is almost set, brush the top with a broom to remove some of the cement and expose the gravel more. For a well-defined outline, the edges of the ditch may be lined with natural stone, brick, or concrete. Keeping the beds raised above the level of the lawn will highlight not only their shapes, but their pretty occupants too. Raised beds can be constructed with brick or concrete for a formal, refined look or with stones for a more naturalistic feel. Logs and timber boards work well for flower beds of geometrical shapes. Trailing plants tumbling over the edges can soften the outlines for more cohesive look. Alpine gardens and cacti and succulent plantings will benefit from the quick-draining feature of raised beds too. Large tires half-buried in the lawn and filled with garden soil and mulch create instant raised beds with an edge. Whatever the type of flower bed edging you install, it would be worth your time, money and effort if it serves to keep the lawn edges neat and tidy. Edging will do its job, whether it blends in unobtrusively or provides an extra decorative touch.